Cancer Cachexia: Might This Molecule Hold the Key? 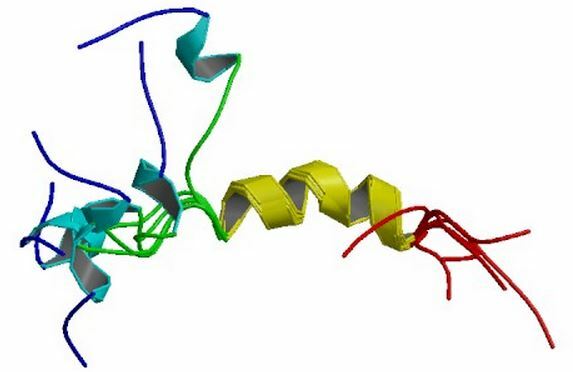 Caption: Structure of parathyroid hormone-related protein (PTHrP), which has been implicated in cancer-related cachexia. No matter how much high-calorie food they eat or nutritionally fortified shakes they drink, many people with cancer just can’t seem to maintain their body weight. They lose muscle and fat, sometimes becoming so weak that they can’t tolerate further treatment. Called cachexia, this progressive wasting syndrome has long troubled patients and their families, as well as baffled scientists searching for ways to treat or perhaps even prevent it. Some previous studies [1-3] have observed that humans and mice suffering from cachexia have “activated” brown fat. This type of fat, as I explained in a previous post, has the ability to convert its chemical energy into heat to keep the body warm. Intrigued by these hints, a team led by Bruce Spiegelman of the Dana-Farber Cancer Institute and Harvard Medical School in Boston recently decided to explore whether tumor cells might secrete molecules that spur similar brown fat-like activity, causing a gradual depletion of the body’s energy stores. Many white adipose tissues, which store fat in large droplets and are often thought of as the bad fat tissue, contain pockets of so-called beige cells. Under the correct circumstances, these beige cells become active and behave like brown fat, burning lipids and producing heat. Not only did PTHrP trigger browning in mouse white fat tissue, but it boosted by 200-fold the activity of the Ucp1 gene, which is critical for heat production in beige cells . This ability of PTHrP to boost heat production and induce browning suggested that it might play a key role in triggering cachexia. To test the hypothesis, Spiegelman and his colleagues injected an antibody into the LLC mice that blocked the activity of PTHrP. In a remarkably clear-cut demonstration, the antibody prevented fat and muscle loss in the tumor-laden mice. These mice also had better muscle function and strength compared to the control group. In contrast, the untreated mice developed severe cachexia. When PTHrP was injected into healthy mice, it didn’t cause muscle wasting or activate genes related to muscle atrophy. But when PTHrP was injected into mice with tumors, the protein accelerated muscle loss. This suggests that, in order to cause muscle wasting, PTHrP may require another yet-to-be-identified ‘X factor’ secreted from tumor cells. Caption: In mice, Lewis lung carcinoma cells secrete a protein called PTHrP, which causes white fat to ‘brown,’ generating heat. 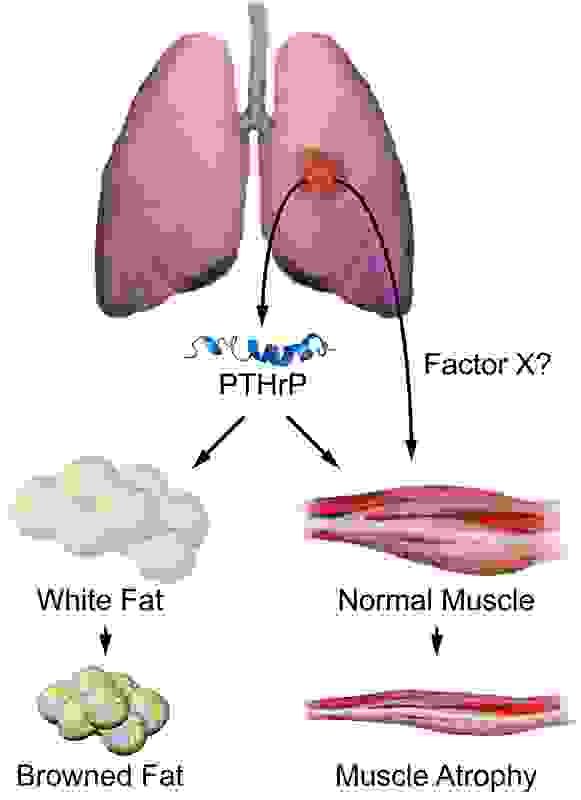 PTHrP, together with another unknown tumor-secreted ‘X-factor,’ also triggers muscle atrophy, or wasting. To determine whether PTHrP plays a role in human cachexia, the researchers tested blood samples from 47 patients with metastatic non-small cell lung cancer or colon cancer to see if levels of this protein affected body composition. Indeed, the 17 patients who had detectable levels of PTHrP in their bloodstream turned out to have significantly less muscle mass than the 30 patients with undetectable PTHrP levels—and their bodies were also burning their energy stores more rapidly. These findings suggest that PTHrP may provide a way to identify which cancer patients at greatest risk of developing cachexia. In addition, these results raise the possibility that molecules that block or lower PTHrP levels may help to reduce or prevent the cachexia associated with cancer—and possibly even similar progressive wasting associated with other conditions, such as heart failure and kidney disease. Finally, some of you are probably wondering if because of its fat-burning activity, PTHrP might be useful for spurring weight loss in obese or overweight people. That’s probably not a possibility because PTHrP is also critical for controlling calcium levels in the body. Too much of this protein causes calcium to be stripped from the bones, leading to high levels of calcium in the bloodstream that can cause kidney stones and disrupt the functions of the heart and brain. Brown adipose tissue in cancer patients: possible cause of cancer-induced cachexia. Shellock FG, Riedinger MS, Fishbein MC. J Cancer Res Clin Oncol. 1986;111(1):82-5. Increased brown adipose tissue activity in children with malignant disease. Bianchi A, Bruce J, Cooper AL, Childs C, Kohli M, Morris ID, Morris-Jones P, Rothwell NJ. Horm Metab Res. 1989 Nov;21(11):640-1. Increased gene expression of brown fat uncoupling protein (UCP)1 and skeletal muscle UCP2 and UCP3 in MAC16-induced cancer cachexia. Bing C, Brown M, King P, Collins P, Tisdale MJ, Williams G. Cancer Res. 2000 May 1;60(9):2405-10. I’m a hospice nurse in Los Angeles. I want to thank you for writing this article about cancer cachexia. I think cachexia is a milestone that humans normally develop when facing a life-threatening illness. Cachexia is one of a constellation of conditions to alert patients and loved ones and health care providers that hospice/palliative referral may be appropriate. Cachexia, sarcopenia appear later in life and may signal arrival of final stages of human growth and development including death. Hospice patients today weigh 93 Lbs and Ht 70″ and BMI 13 at time of first Hospice/Palliative referral after over four years of surgical, chemotherapy, radiotherapy cancer treatment. Rather than trying to eliminate the presence of cachexia perhaps we could embrace the process through continued research and greater understanding allowing compassion and celebration of life well lived to enter the health care team paradigm. I read so much about cancer fighting in the last days. It is surprising me that there are so many ways scientists achieve their goal in fighting cancer! Nevertheless, none of them seem to be ready for global market. Let us go on hoping for at least one method to be successful. As always, another to-the-point article in NIH director’s blog. Thank you, Dr Collins. Indeed, fascinating findings–opening new pathways to treating patients with cachexia, possibly not just in cancer patients. Perhaps even leaving hope for obesity if this so-called factor X is at some point identified. PLEASE direct me to any resources that may be currently addressing preventing cachexia in cancer patients. My 34-year-old nephew has PMP cancer and he is painfully (literally) awaiting CRS & HIPEC surgery … He was strong, and lean but muscular, and now he is wasting, except for the mucinous build up in his abdominal cavity that is so heavy and painfully pressing on his organs. It is horrible. He is drinking ensure, soft soups, etc., but has to be so careful not to get an obstruction. Please forward this to anyone … that can help. Even recipes. THANK YOU. My name is Candace Maynard with the National Cancer Institute’s Cancer Information Service. We are sorry to hear about what your family is facing and will be following up with you directly via email with some information that we hope you will find helpful. Screening and nutrition assessment should be interdisciplinary; the healthcare team (e.g., physicians, nurses, registered dietitians, social workers, psychologists) should all be involved in nutritional management throughout the continuum of cancer care. This new research on cachexia looks very promising. I hope these new findings lead to newer life saving and cost effective treatments for cachexia, cardiovascular and kidney diseases.